GIVEAWAY: Win a $250 Amazon Gift Card! 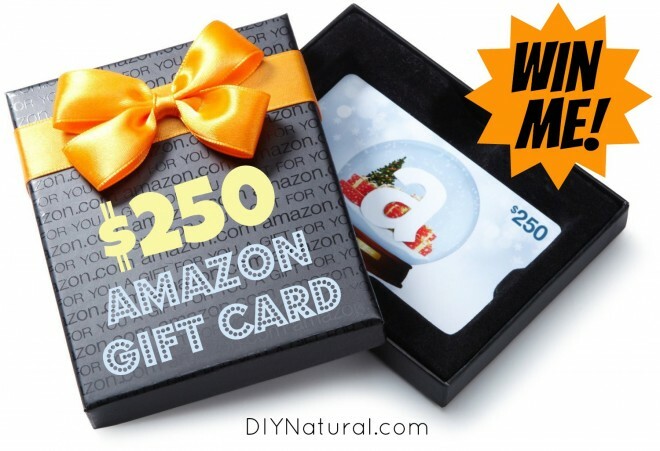 Home DIY Natural Blog Beauty GIVEAWAY: Win a $250 Amazon Gift Card! We’re excited to announce that it’s time for another giveaway! We started these monthly giveaways as a way to give back, and to gift our readers with some of the things they need to live a DIY lifestyle. It’s simple: we choose one great item, you enter, and if you’re the winner we pay out of our pocket and ship it straight to your front door! This month we’ve decided to allow YOU to decide what you need. Kitchen gear? Ingredients for all your DIY projects? A few Christmas gifts? Sometimes it’s just best to have something to spend in whatever way you choose. So for November we’re giving a $250 Amazon gift card to one lucky winner. This will allow the winner to stock up on ANYTHING his or her little heart desires! NOTE: If you’re reading this in an email and see no subscription box, click here to read the article on our website. NOTE: If you’re reading this in an email and see no form, click here to view it now. This giveaway ends at midnight (EST) on Saturday, November 30th. A winner will be chosen via random.org. We will announce the lucky winner via email on Sunday, December 1st, 2013. The winner will have 48 hours to contact us with his or her full name, address, and phone number. There is no purchase necessary to win. I don’t remember if I already entered this giveaway. What will happen if I accidentally enter twice? How can I find out if I already entered? i was just looking at the comments and noticed why we cannot be involved with the contests ( its sad) i love everything you guys do and wont stop reading your newsletter not matter what, but i just wanted to let you know about the Canadian rules for contests, when it says skill testing to be eligible to enter, it just means a simple math question like 2+2= thats all they mean by skill testing, so it wouldn’t be hard to include us dedicated Canadians in some of you contests, just saying.. good luck to all who get to enter, and who knows maybe this time next year we will be involved as well keep smiling and stay well. I entered but I think I entered twice. I am not sure. sorry if I did it twice. Super giveaway from a trusted website!! Thanks for the giveaway and for all the great ideas. Thanks for sharing all the great natural ways of doing every day things. Enjoyed the article on tea tree oil and it’s many common uses. I’d gift it to my friend SHaron that lives in the USA, she has no job currently and can probably find a few things in there that will make her life a bit easier. You would have to enter with all of Sharon’s info to make it a valid entry. We wish giving things away to our community was easier, but unfortunately we have to follow the sweepstakes laws of not only every U.S. state, but also any other countries we include. And to be in compliance for Canada, we cannot use pure luck to determine who wins a sweepstake – there must be at least some element of skill involved, and that doesn’t work for this giveaway. If you would like a law changed you can petition your government, we just ask that you please understand and respect our position. Per the other countries, we didn’t have time to research their laws before publishing this giveaway so we were not able to include them. Hope this helps everyone understand. I understand. If I won I was going to get the all American pressure cooker:). You guys do a great job and I look forward to my news letter. P.s. “skill”. Only means a simple math question. Glitchy entry form. Only submit button i see is under these comments, so i am commenting in hopes it will go through. If this wasnt for $250 i would have given up by now. I noticed the Vitamix blender. We owned one like it and a very expensive juicer that we used off and on. They were both cumbersome and the juicer took too long to clean. We bought a bullet and it has changed our lives. We use it for smoothies and “almost” juicing. It turns food into liquid if you want. We also can make hummus in minutes and I make pumpkin/oatmeal pancake batter. It takes a few minutes to throw food in it and blend and it takes a few seconds to clean. Wow! We love it. I just entered the contest and made a comment, but do not see the posting…how do I verify that the entry was indeed submitted? I live in Mexico, so I do not qualify for ANY of your freebies. Possibly a change is in order? I would LOVE a $250 Amazon gift card. Why can’t that be available here? There is no shipping involved and I use Amazon a LOT before Christmas to send gifts to my 7 children and 9 grand-children living in the US. Your tips are great, just wish I could play also, lol. Do not click on the picture. Please follow the steps to enter in the article and fill out the form. Thank you! Wonderful giveaway just in time for Christmas! Is there a limit to the number of times we can enter? Thanks for asking Paula – yes, only one entry per person. Blessings!